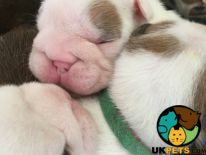 3 QUALITY KC REGISTERED BULLDOG PUPPIES Available to forever loving homes only…. 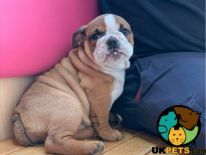 We have for sale 3 beautiful chunky puppies, They have been raised in our family home with our children and our other dogs. They have an outstanding pedigree including many champions to include CH Saint Georges Flash Harry of Bandapart (JW),CH Iceglint I'm Harry, CH Nobozz Drunk & Disorderly, CH Big Daddy of Brampton, CH Mystyle Golden Wonder, CH Terlingfair Country Boy from Mystyle (Re- Impo). The puppies Dam (Wilma) is our much loved family pet who we bred ourselves, she has a fantastic temperament and her fantastic nature is second to none and she is brilliant with our young children, she is a fine example of the breed. Wilma is been HUU unaffected. The puppy’s Sire is Rhydycroesau Ace of Spades at Celticseren who has been lightly shown and is fully health tested, He holds his Bulldog Breed Council Silver Health Certificate, He is hereditary HUU Clear and BOAS tested by Cambridge university. He has also passed his BVA Eye test. The puppies we have available are 1 little girl and two little boys. The puppies were born on 3rd April 2019 and will be available to view from 1st May 2019. They will be ready to leave for their forever loving homes from 29th May 2019. They will have been fully vet checked prior to leaving us, have been wormed correctly and will leave with their first inoculations completed; they will be Micro Chipped, and will come with 5 generation pedigree, 4 weeks free insurance, a full puppy pack and a Puppy Contract. All puppies come with a lifetime of support from us. Non-refundable/ transferable deposit of £300 will secure your puppy. If you require any further information, please don’t hesitate to contact us – Louise – [telephone removed] or Garry – [telephone removed] or [telephone removed]. 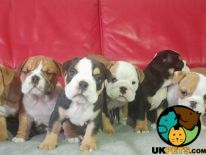 I have a gorgeous litter of bull dog pups.. I have three chunky girls left.. they are HUU clear, health checked, just had there second vaccinations, microchipped. They are wormed and de-fleaded to date. They are excellent with young children and other dogs. They have been well socialised with children and other dogs. Mum is are our much loved family pet and you will be able to meet her. The father is a excellent stud dog who has a great temperament. We travelled a 8 hour round trip for the right dog. We have reduced the price of the remaining three females on hope they will find their for forever home. Sad sale of my kc registered English bulldog. She is a well bred, compact girl with a huge rope. Dad was a lilac American import. She carries blue and chocolate, and possibly tan. She had a litter of puppies with my friend in September last year then came to mine for a sofa life. However, she gets on great with 4 of my dogs but my other bulldog hates her, and I am finding it difficult to keep them separate. She's good with children. She's lazy and not interested in going for walks. She is crate trained in the house and loves to lay in her bed or on the sofa all day. She is great natured and has a fantastic comical character. She's up to date with worming and fleaing, she is on a raw diet which suits her really well. She travels well in the car. She did have cherry eye and the inverted lashes but has had both of these corrected now, so is as healthy as a bulldog is going to be. She such a lovely girl, I can't fault her, but my other girl has been here much longer. Please feel free to ask any questions I may have missed. 2 girls £1800 each OVNO 1 boy £1600 OVNO KC registered British bulldog puppies for sale 2 girls and one boy left from a litter of 5. Mum can be seen, details of dad can be provided. Not vaccinated but micro chipped, flead and wormed. Health checked. Lovely nature and brilliant with children. Loli and Alfie have cherry eye but are being operated on on Tuesday 30th April. English Bulldog Puppies Kc Reg. 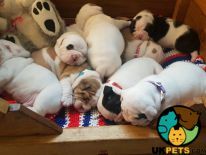 We have a beautiful and very healthy litter of **8 English bulldog puppies** born naturally on 12/03/2019 ready for viewing. Straight tails, wide open noses, clear eyes... active and playful babies will be ready to leave at 8 -9 weeks of age. 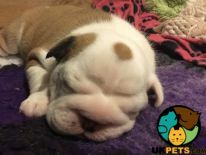 **Father** EGO is pedigree KC registered English bulldog. He is a fine example of the breed standard, has a fantastic temperament and is great with children of all ages and all animals. EGO is a great lilac tri English bulldog. He is a very big build with a very lean and muscular body. He has a fantastic head, with large shoulders, chest. He has no health issues. His eyes are light and very clear. He is UK Kennel Club registered, 2 years old bulldog. **Mother** KISS is a very active healthy Bulldog with NO breathing or skin issues which can be a common problem with the breed. She is a great red and white English bulldog. KISS is 3 years old, she is so smart, loving and playful. She is very sound, healthy and loves everyone. This is her third litter with great puppies and she is a wonderful mother. She gave birth naturally. **We are taking viewings Now** as they are 6 weeks old. You will be able to see all 8 amazing babies and their mother too. They are great around kids as they have been brought up in the family home with lots of love and care. A deposit will be required once a pup is selected of £300 which is none refundable. We are also happy to bring your new puppy into your home if you feel the distance is too far for you to travel. **Loving companion puppies for a reasonable Price** Boy 1- red sable /tri colour- £1550 Boy 2 - fawn and white - £1500 Boy 3 - red sable /tri colour - £1550 Boy 4 - fawn and white - £1500 Boy 5 - red sable /tri colour - £1550 Boy 6 - black tri - £1800 Girl 1 - red and white - £1800 Girl 2 - black tri - £2000 *** All pups come with*** -primary vaccination course -initial flea and worm treatment -microchip -bag of food -KC Reg. + RSPCA sale agreement -5 weeks Kennel Club insurance **Breed information** Size - Medium How much exercise? -Up to 1 hour per day Length of the coat -Short How much grooming? 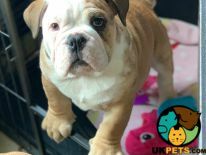 -Once a week Lifespan - Under 10 Years **Don't wait too long** because bulldog remains hugely popular as a family companion for his great character and loyalty. Feel free to contact for further information but no time wasters, please. Ready now, the last beautiful KC Registered bulldog girl that has been home bred. She has Patron Cowboy Shrinkabull lines, as the sire (colour lilac and tan) is a son of the famous Jammie Dodger. This super quality pup will produce rainbow colours. She is well soicialised with kids and other dogs, ready for being a family pet, with a fantastic character. She has her KC paperwork, insurance, puppy pack, has had both injections, microchipped, wormed and has a full vet inspection with paperwork. She is confident, happy and healthy and we have her Mum here to see, who self-whelped. A beautiful pup, give us a call to visit. If you’re going away, no problem we can hold her until you return. We have a 3 year old British bulldog for sale she is white and red. She has never been breed from she’s been a house pet. She is kc registered She has not been spayed her last season was November we are asking for £1,000 for her to go to a family home. With their wrinkled face and black round eyes, bulldogs have a distinctive look. People usually think that all bulldogs are the same, but there are actually quite a number of bulldog breeds,. Each of them is built differently.